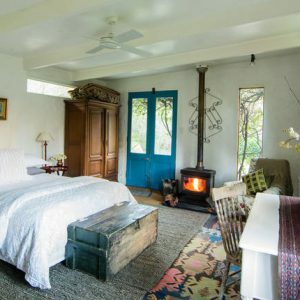 The Potager is a blissful country retreat found at Golden Point, a secluded valley alongside Forest Creek where the first alluvial gold was found in the 1850’s. 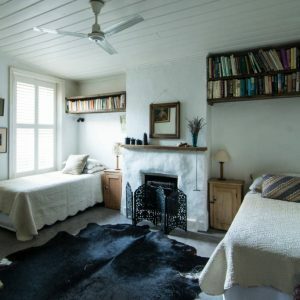 The heritage 1870’s sandstone cottage offers unique self contained accommodation. Brimming with rustic charm the whitewashed interiors are complemented by an eclectic mix of furniture, art, books and modern amenities. The potager garden has been ‘a works in progress’ over the past 20 years and is ever evolving according to the climatic conditions. The cottage has two bedrooms, one with a queen and the other ‘conjoined’ with two singles. 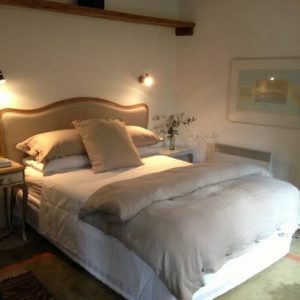 Across a small courtyard is the studio bedroom with ensuite, a queen and a single bed. The kitchen is fully equipped and provides all that is required to cook up a storm with local produce from the Saturday morning market at Wesley Hill, or the farmer market on the first weekend of the month. A spacious stone living room with 6 tall windows with views out to the garden and swimming pool. A wonderful library of books, a refrectory dining table, a huge open stone fireplace, and comfy sofas in which to relax and unwind. The 20 metre x 6 metre in ground swimming pool is hedged by Rosa Sanders, a prolific white rambler, and surrounded by natural bush and abundant birdlife. Beyond the pool is the potager garden, there for the picking!